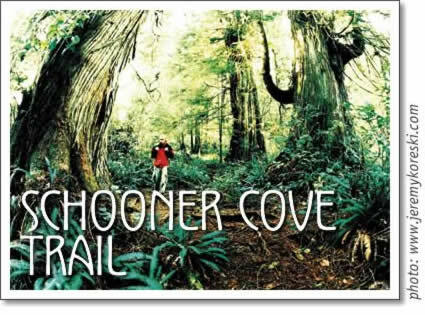 Schooner Cove trail is a short, relatively easy boardwalk trail that leads you to the very northern end of Long Beach. At the end of the trail you can turn right, which will take you to the secluded beaches of Schooner cove, or left, where you can walk to entire expanse (10 km) of Long Beach. The start of the trail is about 16 km south of Tofino. To reach the trailhead, turn at the Schooner sign along the Pacific Rim Highway and park in the lot. The trail begins by winding through a thicket of cedar and hemlock. The wooden boardwalk then takes you through a number of small gullies and over a few bridges spanning small creeks. One of the streams you will cross is a small salmon bearing stream. Up and down the boardwalk you will pass giant cedars and eventually a large patch of salmonberry near the beach. Many people say that salmonberry only ripen after the salmon fry have hatched. When they do they are a sweet juicy berry. Near the end of the trail you will pass a 600-year-old sitka spruce. Not much farther beyond this you will begin the descent to the beach. On the left you will see houses that are part of the First Nations Reserve of Esowista. You empty out onto the beach at the absolute northern end of Long Beach and Wickaninnish Bay. Directly in front is Box Island which divides Wickaninnish Bay from Schooner Cove. At low tide this island is accessible to hikers and harbour seals can often be seen sunning on the rocks. It is also a good spot for whale watching. Wickaninnish Bay, to the left, encompasses everything between Box Island and Quistis Point far in the distance. The bay is named after Wickaninnish, the chief of the Clayoquot people at the time of European contact in the 1770s. Long Beach stretches the entire length of the bay and it is definitely the most well-known feature of the Pacific Rim National Park. The beach is fully exposed to the Pacific Ocean; its sandy shore is surf swept and littered with giant driftwood logs tangled together in an almost endless line at the beach's high water mark. The beach has become a famous year-round playground for surfers, kiteboarders, kayakers, and those who simply love to lounge about on the beach. On the other side of Box Island is Schooner Cove. The cove offers a set of secluded beaches. There is a rough bypass trail that cuts through the thick underbrush, but you can avoid it by going at low tide and walking along the beach. Long white-sand beaches and shelter from the wind make this a very popular beach in the summertime. At the northern end of Schooner Cove you can reach the rocky headland known as Portland point. It's not easily accessible but it provides a great spot for whale watching and surf casting. The trail, depending on how far along the beaches you want to walk, takes about 50 minutes for a round trip. It is about 1.5 km along the wooden boardwalk but once you reach the beaches you have the chance to explore for as long as you would like. Sean McCarroll is an outdoor and travel writer from Nova Scotia.